If you pay attention next time you head into the Grifter’s Marrickville brewery, you might see a sign above the entrance that reads "Fresh & Clean". It’s the name of the old industrial dry cleaning business that occupied the site for 25 years and was responsible for the approximately three inches of lint caking the roof of the building when Grifter moved in, which took them three full weeks to scrape off. Yet, despite this somewhat dusty start to the relationship, they decided not only to leave the old signage but, perhaps only partly in jest, label themselves as Grifter Fresh & Clean Beer Services and name a beer after it. 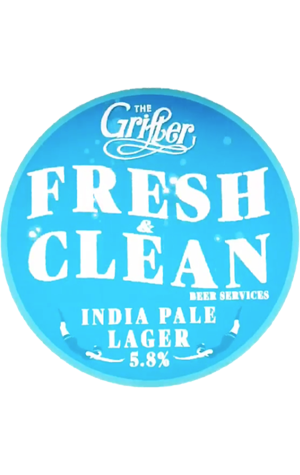 Fresh & Clean the beer is an India Pale Lager and they’d actually brewed it once before; it was one of the first new recipes to come from the new brewery, preceding the opening of the bar by some months. That first release was built largely on the tropical fruit characters of the Zythos hop whereas this new batch has utilised the Bravo variety and, as much as memory serves, the latter is more pronounced than the former was, giving off the kinds of fruity characters synonymous with freshness. But the hidden pleasure in what is undoubtedly a hoppy beer is the malt. They’ve used varieties typically found in Bohemian pilsners in preference to local versions and that’s given the beer a pleasant bready character which, with the chosen hops, helps push towards a rounded feel rather than a crisp finish. Having been fermented long and cold it’s a naturally clear, thus clean-looking, beer. For that alone, we’re almost certain the workers at the old laundromat would approve.